The Communication Studies Department at UNCG is organized around a commitment to engaging communication scholarship that reaches out into the broader community and world through engaged research and service-learning. Mission: We research, teach, and practice communication to cultivate the ethical voices of people that speak in critical, constructive, and transformative ways to identities, relationships, and communities. Philosophy of Scholarship: We believe that communication is formative and foundational to human identities, relationships, and communities–and that ethical and strategically effective communication can be the means of critiquing, constructing, and transforming identities, relationships, and communities. * Public Voice: How can communication scholarship help us to understand and improve the quality of public discourse in the world around us? 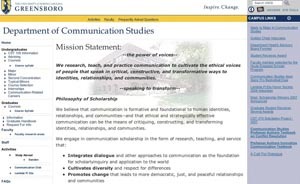 * Voices of Change, Diversity and Difference, and Conflict: How can communication scholarship help people to engage with diversity, differences, and divisions in ways that promote understanding and collaborative/democratic change? * Voices of Identity and Relationships: How can communication scholarship help us understand how people create and sustain desired identities and healthy relationships? * Voices of Discovery: How can communication scholarship help us understand how people learn to co-construct, share, and critique knowledge? Flowing from this philosophy are a variety of qualitative research programs and initiatives, including work on family secrecy, Truth and Reconciliation Commissions, Holocaust survivor narratives, Community health initiatives, immigrant communities, conflict narratives, and worker training programs, to name but a few. In addition, we are housed in a large university (16,000+ students) and so have faculty across a wide range of disciplines engaged in qualitative research.